It is back to school and this year Allie, my 12-year old daughter, has mixed emotions about starting 7th grade in Middle School. She is really excited about being able to choose her classes and especially about learning the cello in band class, but she is also a little nervous about remembering her locker combination and being able to find all of her classes. I am so excited for her to take this next step. Ahead of her is lots of laughter and fun with new friends, and also tears as things won’t always go her way. No matter what lays ahead for her I want her to feel confident and prepared as she takes on this new school and everything that goes with it. 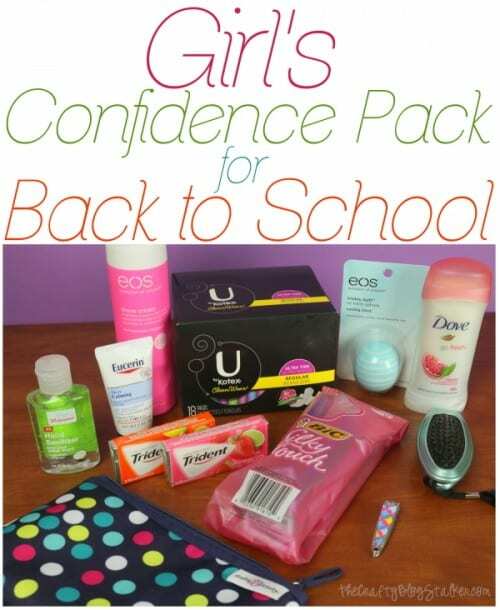 Along with all of the notebooks, folders, pens and pencils that she needs to go back to school, she is also going to be taking a confidence pack so she can feel confident in facing whatever is thrown her way. Her confidence pack is more than a first period kit, but will include everything that she needs to help her feel confident in any situation. So we went to our local Walgreens to find everything we needed to put into her confidence pack. The first place we stopped was the feminine products aisle. She doesn’t need them yet, but I wanted to make sure she has some on the day that she does. We decided on the U by Kotex Clean Wear Pads. They have super soft sides and uniquely shaped wings for a secure and comfortable fit. Plus, the 3D Capture Core quickly draws in and locks away the wetness to help stop leaks. Having confidence during your period depends on using a product you can trust. 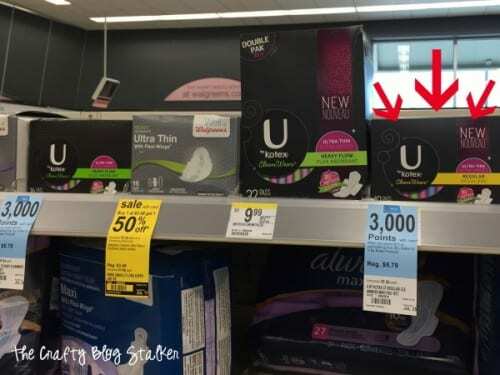 Walgreens is also having a promotional offer that includes U by Kotex, EOS and BIC products. When you buy $15 of participating products you get 3,000 Balance Reward Points. We took Walgreens up on their promotion and got the items we wanted and the Balance Reward Points to apply to our next shopping trip. In addition to the U by Kotex pads, she got some EOS Lip Balm, EOS Shaving Cream, and BIC Silky Touch Razors. After we were all done shopping she had a pretty good pile of stuff! 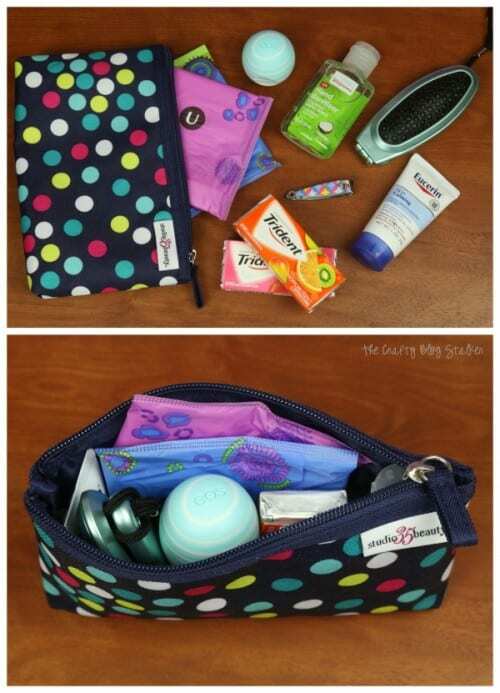 The polka dot pouch is the perfect size to put her items in for school. Plus the bag is super cute, her favorite color is blue so it completely fits her style. We even made a super short little video about the items she put in her pouch. She doesn’t need everything we bought at school, some of it is better to stay at home and keep close in the bathroom. That is is where she can keep the box of U by Kotex Pads, EOS Shaving Cream, BIC Silky Touch Razors and the Deodorant. As we were creating her Confidence Pack we were able to have a great mother daughter conversation and talk about things like her friends, boys and the dreaded, what will happen when she starts her period. She doesn’t love talking about her period, but my sweet Allie is getting older and I want her to be prepared for whatever life throws at her, including her period. Do you think Allie and I missed anything? What different items would you put in a Confidence Pack? OR how did you teach your daughters about surviving their cycle? I’d love to hear your best tips! You can find more great Cycle Survival inspiration at http://cbi.as/aciy. I love this confidence pack! I take one of these to work. Thanks so much for sharing at Merry Monday. Thank you so much! Now I know what to buy before school starts! You are so welcome! Glad I could help! I’m starting middle school next year and this will definitely help, thanks 😄! Don’t forget the chocolate! Every girl/young woman deserves some chocolate to get her through! Love these ideas. I’ve been thinking about what to put together for my granddaughter. Of course! I can’t believe I forgot the chocolate! That is very important! 🙂 Thanks Cathy! Not to mention, chocolate helps with period cravings!